This is the third and last workshop I performed in Europe this summer. It was also the most difficult one, because the participants were all tea professionals: tea house owners with a staff or partner! 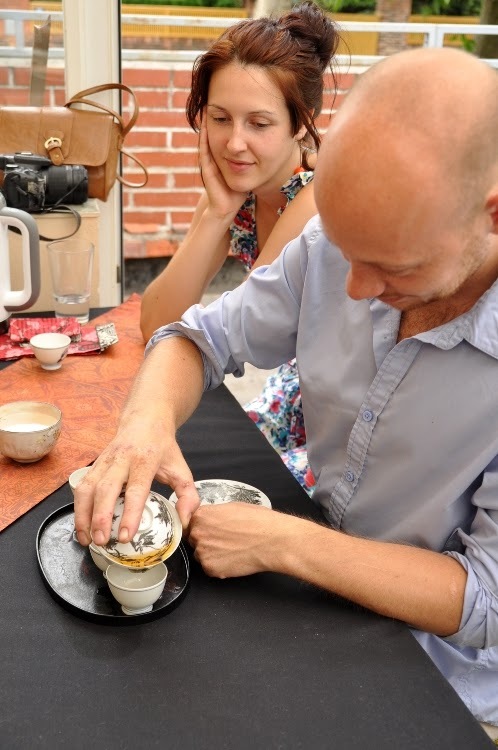 For them, tea is more than just pleasure, it's also a business. And it's very tough, because they are facing a broad range of consumers: people who know next to nothing or only cheap, scented tea bags, people who come for the special atmosphere of the tea house, the health benefits obsessed, those who want to learn more about tea... They need to have a tea for each guest and it must be cheap enough to let them earn a living. It's really a challenging job, because their tea drinking population extends much beyond the audience of a specialized tea blog like mine. Everybody might take a break in a tea house one day. The market for premium teas is so small that it would be easy to overlook it. Most tea houses (and stores) in Europe and America actually prefer not to take the risk of purchasing leaves that cost more than 10 cents per gram according to my experience. 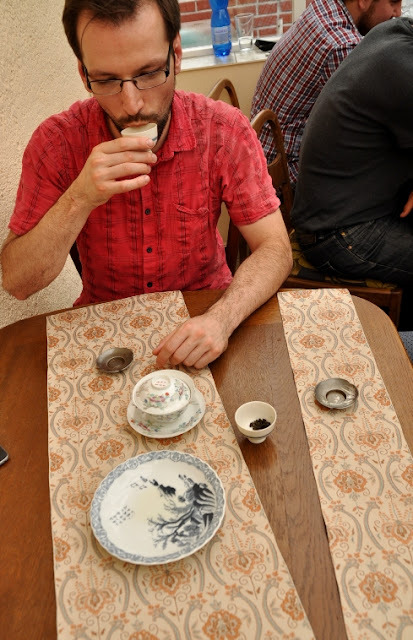 But even if there's only a small demand for a high mountain Oolong or a high grade concubine, I feel that it's important for a tea house to have them on its menu. 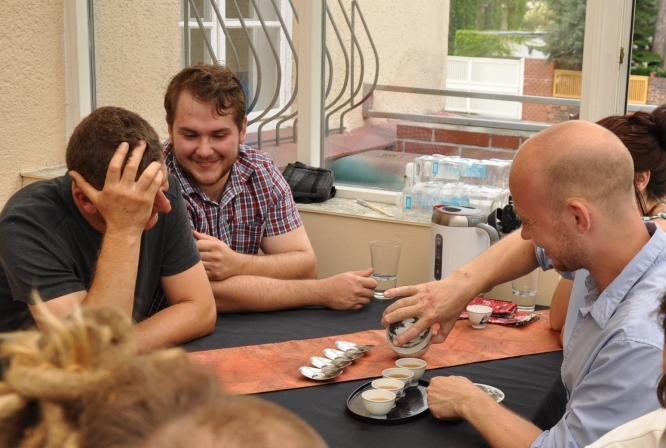 It shows a certain level of understanding and tea passion that can set it apart from other houses. It's like for a restaurant to have fine grands crus classés Bordeaux on their wine list. It shows they are serious and committed to excellence. With tea, though, it's not enough to have good teas on your list, you also must know know how to prepare them properly. That's why I gave these tea house owners/managers a very similar training than to the tea aficionado in the other 2 workshops. There are lots of principles and techniques that also apply to lower grade teas. Using good (filtered) water, for example. 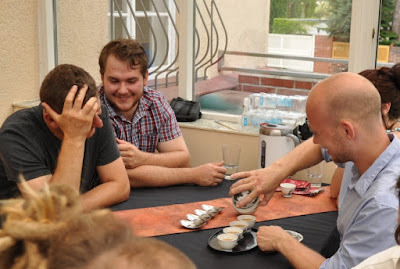 I taught them to pour with a gaiwan without spilling water around the cups (without a pitcher). 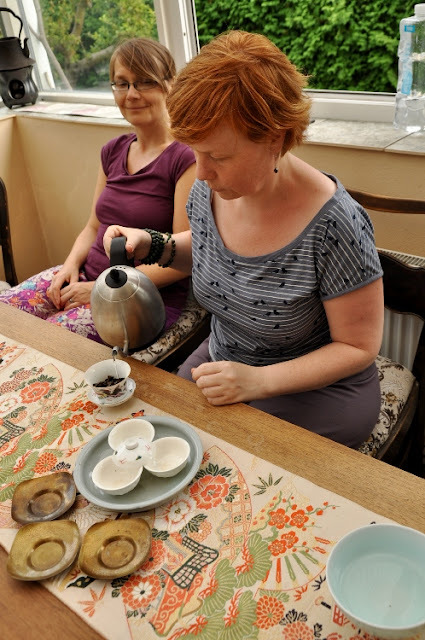 I also showed that with great tea, you don't need to use so many leaves. 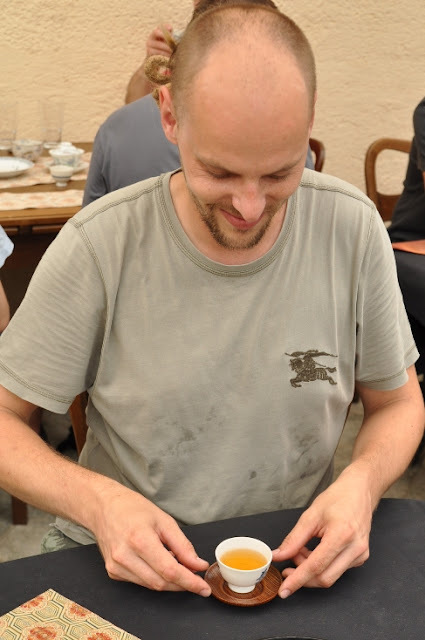 A layer on the bottom of the gaiwan is sufficient. This is how a tea house can make premium tea more affordable for its customers. And the skilled pour also demonstrates the fact that tea brewing takes skill and calm. We had some burned fingers, but also lots of happy faces and many questions. One of the recurring question is why I don't rinse my Oolong leaves. The fast answer is that I love my teas so much that I don't want to waste a drop, especially not the very first flavors that come out, since these are also the lightest! Rinsing Oolong is done for of different reasons. Let's examine these reasons one by one and see why none stands. 1. "To clean the dry leaves like you would clean a vegetable or fruit before consumption." And for the same reason, nobody is rinsing Japanese green tea. Because the first flavors are the nicest. And why should Taiwan Oolong be less clean than Japanese (or Chinese) green tea? And how about those Oolongs that have been treated with lots of pesticides and fertilizers? Isn't it better to rinse them? For such leaves, the problems are not limited to the surface of the leaves. The best solution is probably not to drink them at all! 2. "Rinsing is done to prepare the leaves to open up. The quickly rinsed leaves are easier to brew." The answer is to do a thorough preheating of the tea vessel. 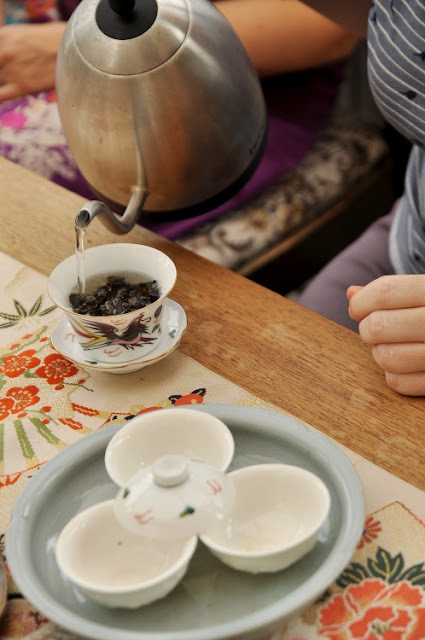 A gaiwan or teapot that is preheated with boiling water will enable the proper opening of the Oolong leaves during the first brew. (It's because many people use the rinse to preheat the vessel that they feel it's necessary). The other problem with the quick rinse is that it pushes all the leaves to the side from which you make the pour. This puts the leaves in a skewed position. Since our goal is to let the leaves open up and fill the gaiwan evenly, it's easier to do so if we start with leaves that lie evenly at the bottom the gaiwan or the teapot. 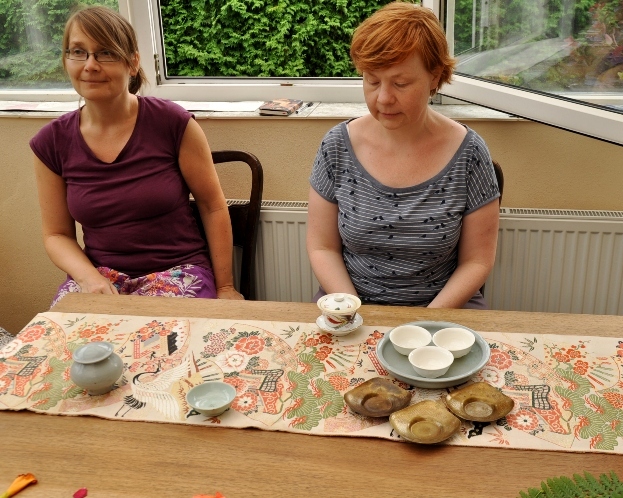 You may shake your teapot or gaiwan to move the leaves back in the middle, after a rinse. But this movement feels unnatural and not harmonious compared with the alternative of starting to brew with the leaves the way you let them glide into the vessel. I feel a distance, a suspicion between us and the tea if we discard the first brew. There need not be any distance with something so extraordinary as good Oolong! Thanks to all of you to help your customers gain a first access to the world of real teas! 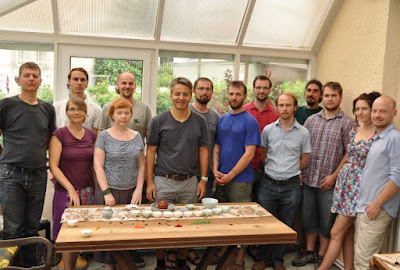 I was happy to share my point of view, my technique and my passion for tea with you! 2. 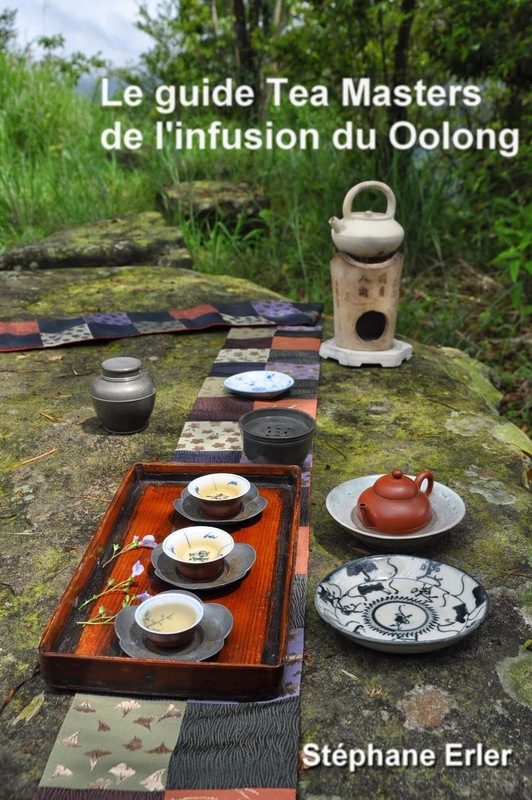 Spring 2013 Da Yu Ling Oolong, the highest plantation shows it still feels fresh and powerful. 3. Winter 2013 Yong Lung Hung Shui Oolong, the standard Dong Ding Oolong. Balance of roast and freshness. 4. 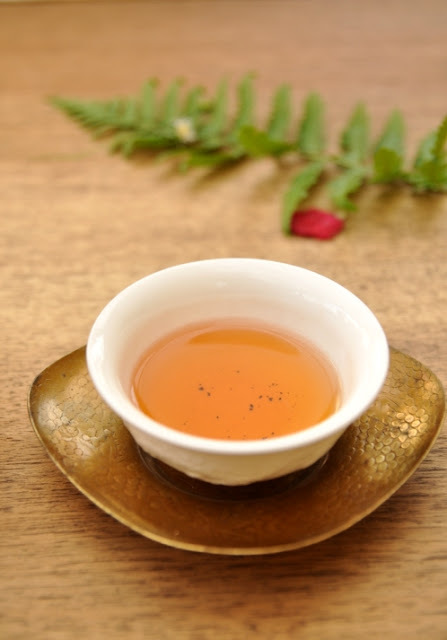 Spring 2013 Concubine Oolong from Feng Huang, high oxidation with an organic method. Sweetness. 5. Spring 1999 Hung Shui Oolong from Yong Lung, the beauty and refinement of aged Oolong. The unusually narrow, curving spout of that kettle might make it easier to control the speed of pouring...what do you think? 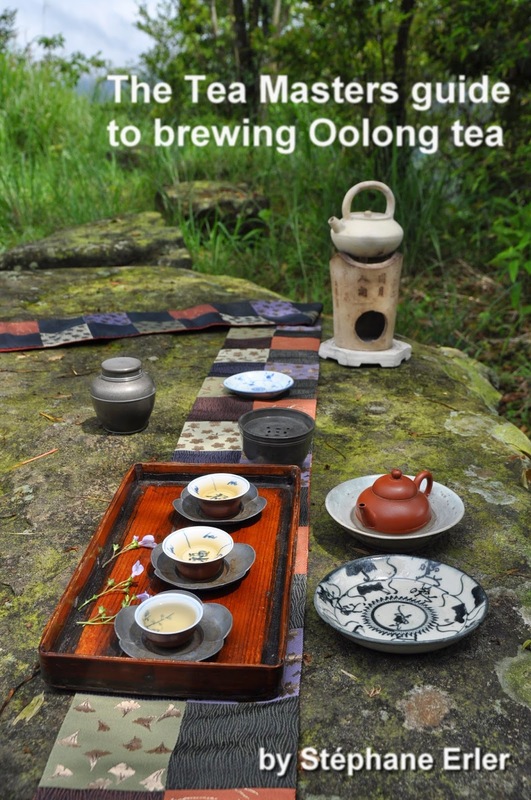 As for your Guide to Brewing Oolong Tea, I find myself going back to it repeatedly, picking up a new idea each time. It is so valuable! This kettle is originally for coffee making, but I chose to use it in Prag because, as you rightly noticed, it gives the best control for pouring: speed and also place where the water hits the leaves. I'm glad you find my guide so useful!